On 21st December, 2012, according to the Mayan calendar, the end of the world was nigh. “The Rapture” was due. But who knew that, apparently, there was just one place on the planet that was safe: the Valle d’Itria (The Itrian Valley). Followers of an ashram in Puglia theorised that a Mayan prophecy foretold that the only way to save oneself from “The Rapture” was to head straight to the Itrian Valley, an area of land down south on the stiletto heel of Italy. That December, so I have been told, hotels in the area were packed to the rafters and all flights to Brindisi were full. According to the mayor of Cisternino, one of the towns in the Itrian Valley, it was looked on as “a place of salvation”. Many followers of Indian Master Babaji, whose ashram has been a sanctuary among the trulli in Cisternino since 1979, have settled permanently in Puglia with their families, convinced that the Itrian Valley is the safest place on earth. As far as I am personally concerned, the Itrian Valley could easily be the friendliest place on earth too with its particularly relaxed pace of life. Situated between the Ionian and Adriatic seas and spread through the provinces of Bari, Brindisi and Taranto, when you are in the Valle d’Itria you are close to beaches whichever way you turn. Situated on a limestone plateau known as the Murgia, the landscape is full of pot-holes and ravines giving rise to plenty of streams and rivers. This geological phenomenon has also created the caves, with their stalagmites and stalactites, known as Grotte di Castellana, which are located 45kms south west of the city of Bari. Dotting the landscape of the Itrian Valley are round stone-built houses with cone-shaped roofs known as trulli. 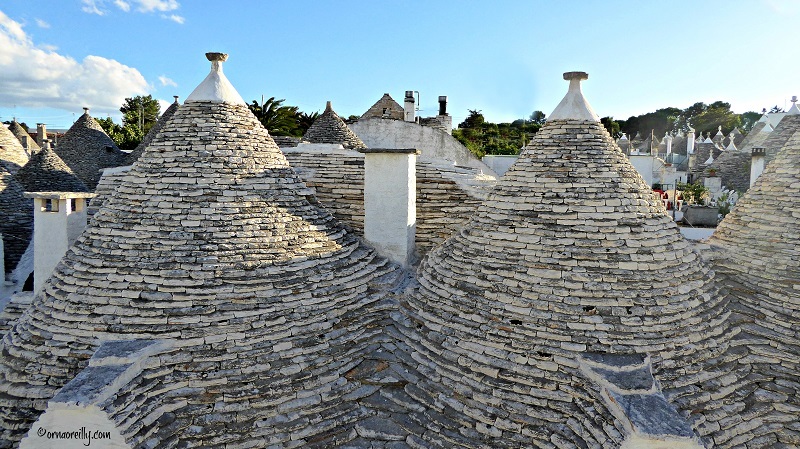 If you don’t yet know what a trullo is, it is made of limestone in a style of architecture unique to Puglia. Very quaint and interesting looking, trulli (plural) are built using a prehistoric technique in which the stones are laid on top of one another and no mortar is used. The story goes that they were built in this fashion in order to be easily dismantled when the tax collector came around, but how true this is I have no idea. The rolling, verdant Itrian Valley is criss-crossed with dry-stone walls and narrow winding roads. It is lovely to see the jaunty cone-shaped roofs of the trulli, in various states of repair or disrepair, peeping out from amongst the endless olive groves and vineyards. These quaint homes dot the countryside, though there are many derelict trulli to be seen alongside the magnificently restored ones which are now used as homes and holiday rentals. Olive trees and vineyards are predominant and foodies won’t be disappointed at the variety of foods and wines available. Pastas you will see on every menu are either orecchiette or cavatelli – both small and ear-shaped. Typical dishes from this area are fave e cicorie selvatiche (broad bean purée with wild chicory), orecchiette con polpette (pasta with tomato sauce and meatballs) and bombette (pork meatballs). And one must not forget to try the wonderfully creamy burratina cheese. Accompanied by the local rosato wines, the food flavours are out of this world. The main towns of the Itrian Valley are Cisternino, Alberobello (a UNESCO World Heritage site), Ostuni, Locorotondo, Martina Franca and Ceglie Messapica. Cisternino, the location of the aforementioned ashram, is a whitewashed hilltop town with stunning views of the Itrian Valley. It has deservedly been designated one of Italy’s borghi piu belli (most beautiful towns) and has a charming centro storico (historic centre) full of narrow winding streets. As you wander uphill, close to the 13th century Chiesa Matrice and the Torre Civica, you will find flowerbeds and benches at the well-tended view point. 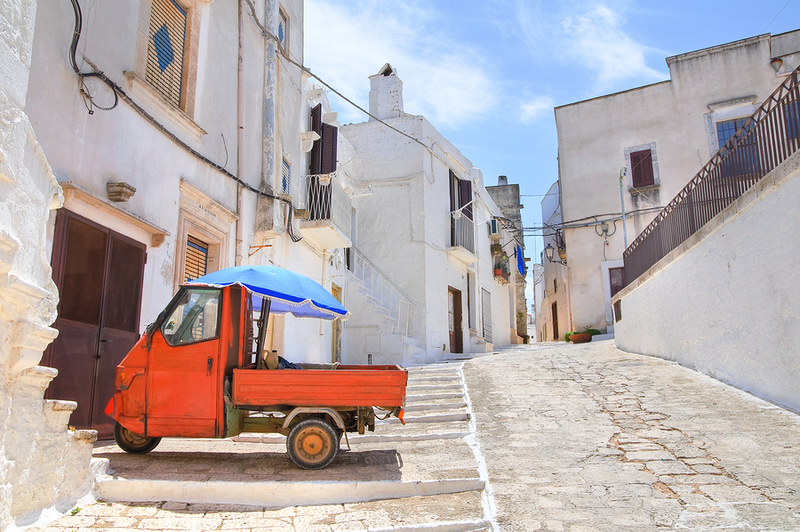 The narrow streets contain the typical white washed, stone buildings of Puglia, with cool, cave-like interiors. This pretty town is well known for its roasted meats, prepared and cooked on the spot by the local butchers. All you have to do is select the piece of meat you want and it will be ready to eat in a few minutes. The word “alberobello” literally means, in Italian, “beautiful tree”, named after an oak forest that once covered the area. Alberobello is a UNESCO World Heritage site since 1996 and when you visit there you will know why. Even though it is the most touristic spot in Puglia, it is worth seeing for its uniqueness alone. 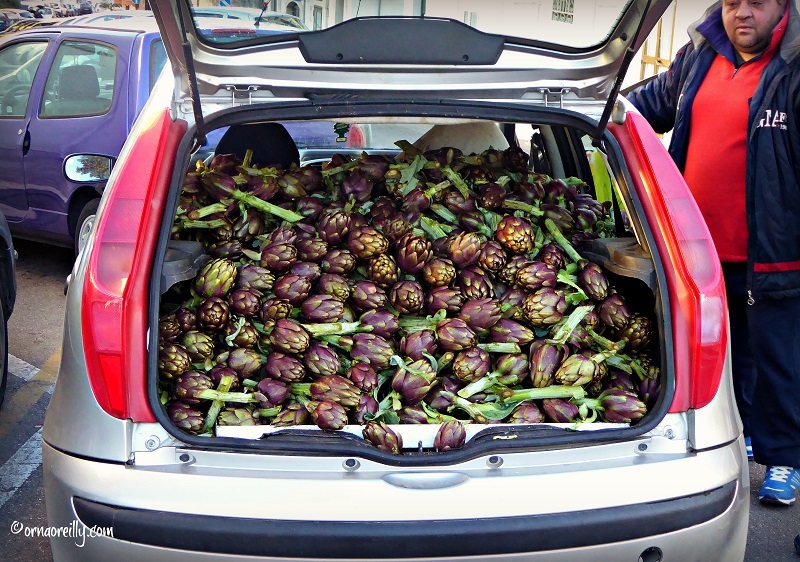 This highly unusual town is situated north of Brindisi and contains 1,500 trulli. Strolling through the quaint streets, I was interested to see that many of the original trulli have been transformed into souvenir and coffee shops. The architecture is a sight to behold and the trullo church is stunning. If you are looking for an unusual place to visit in southern Italy, it is well worth taking a side trip to Alberobello. There are many hotels in the area and several trulli have been converted into B&Bs. 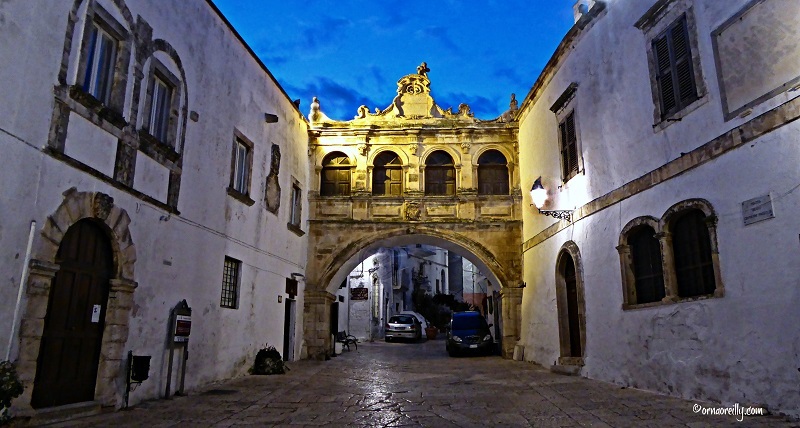 Ostuni is a wonderfully chic town draped over three hills and known as La Citta Bianca (the white city). Its houses and walls are painted white and it is quite thrilling to see it for the first time as one approaches by road. It is quite unique. Highly popular with tourists in summer and full of excellent restaurants, pizzerias and bars, my own personal favourite is the bar/restaurant White Ostuni Tito Schipa. Their pastas, salads and fish dishes are excellent and their staff are super friendly. Ostuni is regarded as an architectural marvel with its white tumble of buildings topped by the Cathedral and the Bishop's Palace. Narrow winding streets lead up to the “Old Town” within its city walls, passing by a multitude of tiny shops selling a variety of souvenirs and ceramics. 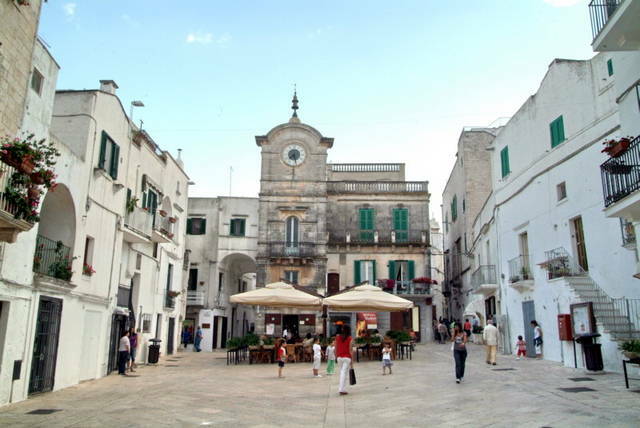 Ostuni is in the province of Brindisi and has a population of about 32,000. It is popular for its beaches – there are many in close proximity – and has a food culture which includes wonderful olive oil and wine, not to mention its many fish restaurants. You can book to stay in a Pugliese "masseria". “Masserie” (plural) are large fortified country farm-houses, which have been adapted for visitors and contain restored farms, restaurants, self-catering and B&B accommodation. There are several in the Ostuni area. On one of our many journeys of exploration in the Itrian Valley we discovered the pretty little town of Locorotondo, also classified as one of the Borghi Più Belli d’Italia (Italy’s most beautiful towns) and definitely living up to its reputation. Surrounded by vineyards and olive groves, Locorotondo has been settled since ancient times. 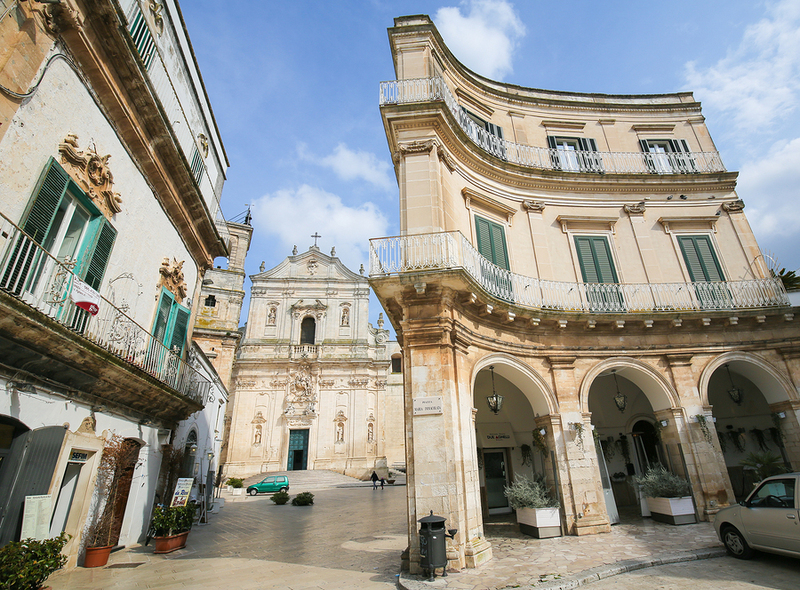 This pretty town is situated in the province of Bari, and has a population of around 14,000. Apart from being famous for being beautiful, it is also well known for its Denominazione di Origine Controllata (DOC) wines and for its circular centro storico (historic centre), from which the name Locorotondo, (round place) comes. As we strolled through the charming, well-maintained, little streets we passed by tall, narrow white houses with steeply pitched roofs. These unusual homes are called cummerse and are peculiar to the centro storico of Locorotondo. These slim, angular buildings predominate the centre of this round town. Lunchtime called and we found U’Curdunn, a busy restaurant where we had a delicious lunch washed down with some of the local white wine. The comune (municipality) of Locorotondo produces a white DOC wine with a minimum alcohol percentage of 11%. It is made either still or sparkling. 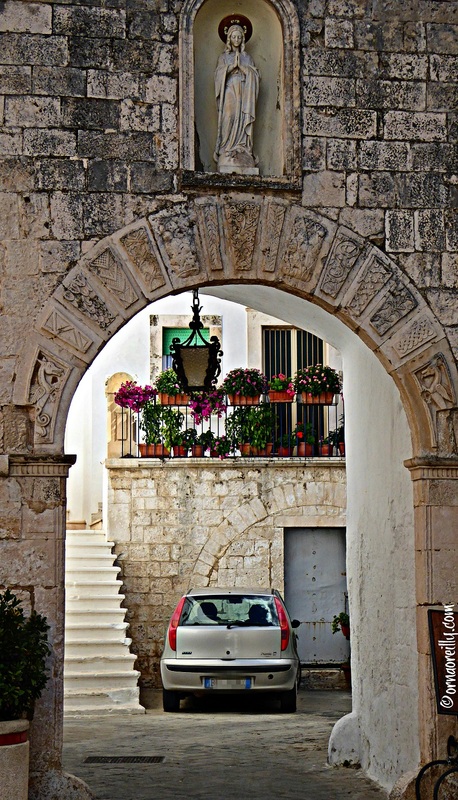 Martina Franca is the highest town in the Murgia and is famous for its annual opera festival, held in July and August. It is in the province of Taranto. The centro storico is particularly pretty and the old walls house baroque gates which bring you through to lots of narrow winding streets and pretty piazzas. The Martina Franca DOC wines are either still or made in a sparkling Spumante style, similar to the wines from Locorotondo. It is olive-oil country, with many vineyards too yielding mainly white grapes. It is possible to visit many of the local frantoio (olive mills) and vineyards to sample the wonderful oil and wine. Another important local food product is capocollo, a Denominazione di Origine Protetta (DOP) (protected designation) product. This is a salami made from pigs reared in the Itrian Valley. Here you will also see herds of sheep and goats, while donkeys and “murgese” horses are specially bred in the area around Martina Franca. With a population of about 21,000 the town of Ceglie Messapica is situated in the province of Brindisi surrounded by plentiful olive groves. We spent a delightful evening exploring the quaint town with its narrow streets where the front-door-steps encroach in a most alarming way if you are driving a car! Escorted by friends to a nameless trattoria tucked away in a back street, we entered possibly the tiniest place in which I have ever eaten, bar my own kitchen. But I am reliably informed that Ceglie Messapica is full of wonderful eating establishments which are regularly visited by food critics who arrive armed with their laptops. Having noted the immaculate main piazza as we strolled through, I was told that the 11th century castle is well worth a visit next time. All in all, the Itrian Valley in Puglia should be on everyone’s bucket list. It is a uniquely beautiful area, populated with super-friendly people and has something to offer for all the family. And, don’t forget, it’s a safe haven if the world is about to come to an end! If you are looking for a way to discover more of Puglia's hidden secrets, we recommend hopping on one of these luxury small-tour experiences taking you to the heart of the region.